Residents are invited to attend a community open house to view the proposed plans for a new park on part of 3071 Riverside Drive, on the south side of the Canoe Bay development project. 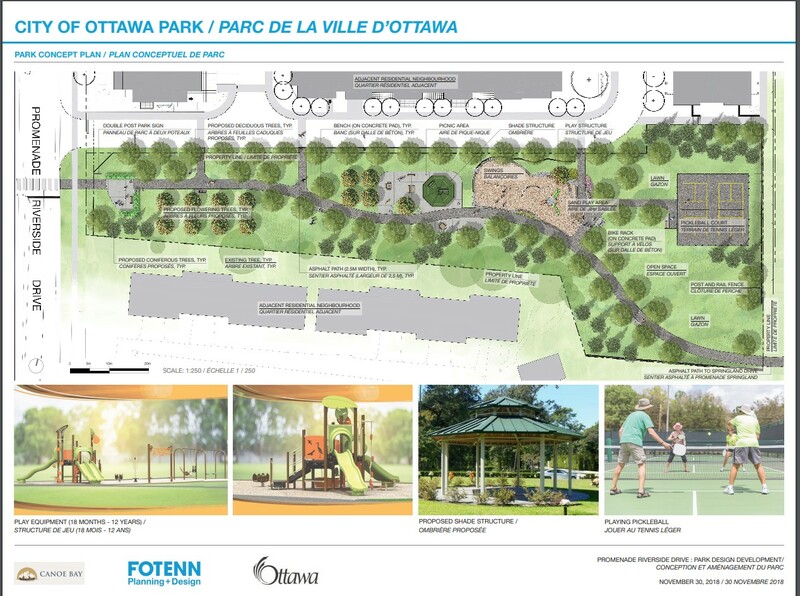 The concept plan below has been prepared to illustrate the new park situated on part of 3071 Riverside Drive. The park will have an area of 0.6 hectares (1.5 acres). Proposed park features include an accessible asphalt pathway extending from Riverside Drive to Springland Drive, a double pickleball court, an accessible play structure for children from 18 months to 12 years of age, swings, an overhead climbing structure, a sand play area, a gazebo, seating areas, an open play area and landscape planting. Residents are invited to provide comments on the proposed concept plan, as shown below. Please note that the proposed concept plan was developed taking into consideration the online survey results. Please share any comments regarding the proposed concept plan to myself at Riley.Brockington@Ottawa.ca and the Parks Planner listed below.